The K&N 33-3046 replacement, washable, and reusable air filter fits into the factory air box and enhances airflow be utilizing a low restriction, oiled, cotton gauze media. Italian-automobile manufacturer Fiat has been instrumental in promoting the popularity of the so-called city car with its Fiat 500 and Fiat Panda. The Fiat 500 was introduced into the United States for the second time when the Fiat Group acquired a 20% stake in the U.S. car manufacturer Chrysler in 2009. Helped by its association with Chrysler, the 500 has received a better welcome in the U.S. market than the one it experienced in its first unveiling in the 1950s. The car suffered reliability problems causing many Fiat owners to refer to F-I-A-T as, “Fix it again, Tony.” In 1983 Fiat ended its first endeavor into the United States. When Chrysler was on the verge of bankruptcy and possible death as one of the Big Three American automakers due to the recession of 2008-2009, Fiat stepped in, and worked out an agreement with Chrysler and the U.S. government that ultimately saved the company. 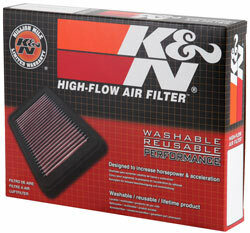 K&N ships the filter pre-oiled, so all you have to do when you get it is install it and drive. The Fiat 500 was the first car released by Chrysler-Fiat as a result. In 2013 Fiat introduced the Fiat 500 turbo. It was the fifth variants of the 500 that included the Pop, Sport, Lounge, Turbo and Abarth. The 1.4-liter four-cylinder engine that powers the 500 turbo generates 135-horsepower and 150 lbs-ft of torque from 2,500 to 4,000 rpms. In comparison, the turbo-less 500 has a 1.4-liter four-cylinder engine that delivers 34 fewer hp and 52 fewer lbs-ft of torque. The turbo and Abarth share a heavy-duty 5-speed manual transmission and it has a fuel economy rating of 28 mpg in the city, 34 mpg on the highway and 31 combined mpg. In comparison, the base 500 with manual transmission achieves a combined mpg of 34. A 101-horsepower 1.4-liter four-cylinder engine powers the 2015 version of the 500. Fiat offers a choice of two transmissions –- a 5-speed manual or a 6-speed automatic. The exterior exhibits 15-inch steel wheels. However, 15-inch or 16-inch aluminum wheels are also available. It also includes power-adjustable heated side mirrors, rear spoiler, and chrome exhaust tip. Fog lights and power sunroof are also available. Inside the car features clothe upholstery. However, leather is available. Other characteristics include a 50/50 split, folding backseat, leather-wrapped steering wheel, remote keyless entry, and Bluetooth connectivity. A navigation system is available as an option. The Fiat Panda was introduced in 1980 as a no-frills utility vehicle. It came in two styles –- 3-door hatchback and 3-door cabriolet and buyers had a choice of eight engines. The gasoline engines included a 652 cc I2, 769 cc I4, 903 cc I4, 965 cc I4, and a 999 cc I4. There was one diesel engine, a 1,301 cc I4. The Panda is currently in its third generation, which began in 2011. Six different engines are available to power the vehicle including four turbocharged. Five models are available –- Panda Natural Power, Panda EasyPower, Panda Trekking, Panda 4x4, and Panda Cross. There are two special edition models including the Panda 4x4 Steyr, which celebrates Fiat’s partnerships with Steyr-Daimler-Puch; and the Panda 4x4 Antarctica, which celebrates the 30th anniversary of the Panda 4x4. To protect the various engines that run both the Fiat 500 and Fiat Panda, K&N is offering the 33-3046, washable and reusable replacement air filter. The air filter can be cleaned at intervals of up to 50,000 miles depending on driving conditions, works with OEM vehicle electronics and will not void the vehicle warranty. K&N backs the filter with a Million Mile Limited Warranty® that ensures that it will last for up to 10 years or 1,000,000 miles. It is able to last for so long because of the way it is constructed. The filter features multiple layers of cotton gauze media that has been treated with a special grade of filter oil that causes the strands of the cotton gauze to become extremely tacky. This permits the filter to capture and hold particles until it is cleaned with the K&N 99-5000 air filter cleaning kit. 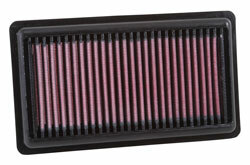 You can view all the air filters that K&N makes for these vehicles at the Air Filters for the Fiat 500 or Air Filters for the Fiat Panda page. You can view all the K&N performance products for any vehicle by using the Search by Vehicle tool and you can find a local K&N retailer by plugging your location into the K&N Dealer Search as well.